If you don’t want to start using a sophisticated tool to manage your efforts, you might be interested in adopting some web tools that will fit your particular need to share some project information or status among all the team members. This article presents some online tools that are based on Scrum and Agile approaches, that implement specific practices (backlog management, burndown chart) and that are freely available (no commercial/paid version!) on the web for distributed Scrum teams. Retrospective tools are not mentioned as we wrote a specific article about free retrospective tools for distributed scrum teams. The Scrum planning poker tools will be also soon listed in a separate article. We will not present in this page the free option offered by commercial Scrum tools vendors, neither some free offer from tools that are still in their beta stage. You will find only tools with no commercial option that are completely free (and supposed to stay so). If you want to add a tool to this page, just let us now using the comment form or the contact page. 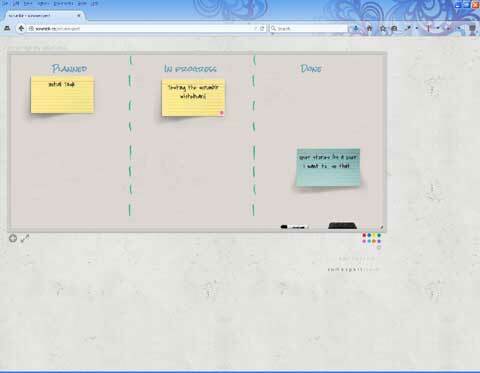 scrumblr is a shared simple whiteboard where you can post post-its. The whiteboard can be split so that you can manage a simple equivalent of a taskboard. The posts-its are available in three colors and small color tags can be added to the post it to give some additional visual information about it. You can also use this tool for retrospectives. The interface is supposed to be intuitive, so you have to discover the available features. TaskJunction is an online tool to plan, estimate, and track your software development projects that supports Scrum. It allows create an unlimited number of projects and iteration for your software projects that you can manage through taskboards and track with burndown and other relevant charts. Once you register, a step by step process helps you to add the initial data for your project. 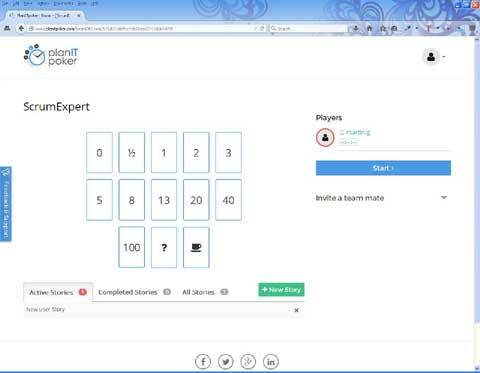 PlanITpoker is an online Scrum planning poker tool for Agile project teams. You can create multiple poker planning rooms using different planning methods and invite the other team members. ScrumTool.me is a free online tool for Agile projects that allows you to manage up to two Scrum projects. It allows creating projects, user stories and tasks so that you can manage both the product backlog and your sprints. Sprints are managed with a visual board with fixed columns. The tool is supposed to be intuitive and has no help systems. I couldn’t however manage to find how to connect tasks with people or to define how much work has been done to update the sprint burndown chart. This tool looks to me more like a “work in progress” than a complete solution. Apa is a free simplified online tool for Agile projects that provides easy-to-use Scrum and Kanban boards. You can change any board to fit your needs by simply dragging and dropping stuff around. It is very easy to create columns, change their widths or rearrange them. The tool provides many charts: Burndown Chart, Cumulative Flow Diagram, Lead Time / Cycle Time diagrams. Once you have created a project, you can simply invite people to join it by email. Scrumvee is a free online tool for Scrum Poker planning, featuring a mobile Android app and a browser platform to manage all the Scrum plannings a software development team. Each developer selects the Scrum estimation from its own smartphone, without interfering and potentially affecting other team members. The ScrumMaster can easily see all the estimations. Starting a new estimation round, restarting one or choosing the winning estimation card is very easy. All rounds, estimations and meetings are saved for posterity. See how many of your teammates estimated correctly and how often. Easily spot poorly defined stories or team members which are constantly over or under estimating. The tool is integrated with JIRA. easyBacklog is a completely free service that help you manage your Agile and Scrum backlogs and sprints efficiently. You can create versions of your backlog and compare them. You can estimate a budget for the items and easily create a high level cost estimation. Print Your Burn Down Chart is an online tool to create a ideal burndown chart. You can define the start and end date, actual working days and choose different options like having a burnup chart. Trello is a good tool and we have already published an article about using it for Scrum on http://www.scrumexpert.com/tools/agile-and-scrum-trello-extensions/. However, Trello is not directly aimed at Agile project management and it has a paid version, so it doesn’t meet the criteria of ” only tools with no commercial option” that we use to select the tools presented here. A relatively new tool that is probably worth reviewing – Scrumpy Planning Poker. It is a completely free, zero install, no registration application for online planning poker with distributed teams that runs on any device and integrates with Jira, Confluence, Stride and Slack. It brings fun and joy to refinement sessions. I will think about it when I will write the article dedicated to Scrum planning poker tools.